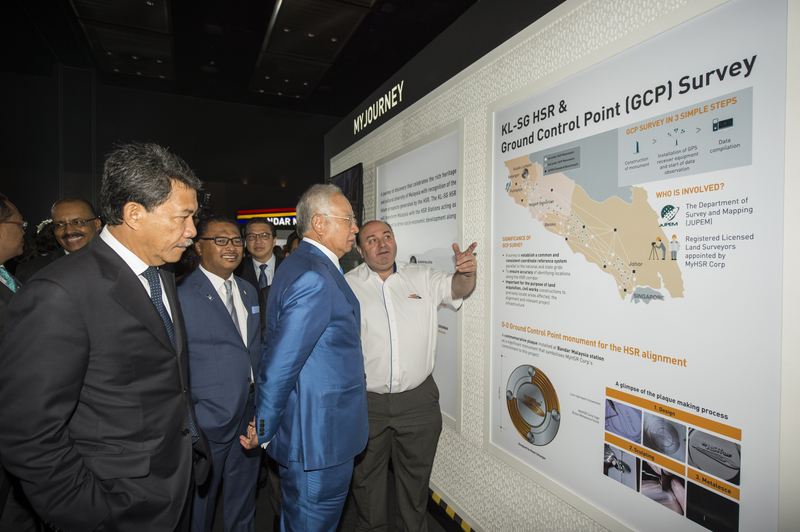 KUALA LUMPUR: Prime Minister Datuk Seri Najib Razak today declared the Kuala Lumpur-Singapore High Speed Rail (KL-SG HSR) project a "key catalyst" in seamless connectivity to drive the economy of both countries into the future. The bilateral nature of the project, he said, will see connectivity revolutionised on many fronts, highlighted by the agreement between the two countries that provides seamless travel on board the HSR with customs, immigration and quarantine (CIQ) checkpoints slotted at departure areas. "This would provide a thrust in the concept of seamless travel, with the CIQ checks required only at ports of departure at the Bandar Malaysia, Bandar Puteri and Jurong East (Singapore) stations," he said. The prime minister was speaking at the unveiling of the concept designs for the seven HSR stations. "This will transform the concept of a borderless world from a seamless travel standpoint"
The seven stations - Bandar Malaysia, Bangi-Putrajaya, Seremban, Melaka, Muar, Batu Pahat and Bandar Puteri - will feature facades with concepts derived from local heritage with a futuristic twist. Present at the event were Chief Secretary to the Government Tan Sri Ali Hamsa; MyHSR Corp chief executive officer Datuk Mohd Nur Ismal Mohamed Kamal; Negri Sembilan Menteri Besar Datuk Seri Mohamad Hassan, and Melaka Chief Minister Datuk Seri Idris Harun. Meanwhile, Najib said the government, guided by the Economic Transformation Programme (ETP) which had created over 2.6 million jobs in the past six years, has managed to keep inflation and unemployment low despite the uncertain global economy. "The KL-SG HSR will contribute to a long term positive output for the economy as it has the potential to revolutionise connectivity in the Southwest Corridor of the Peninsula, impacting the way we conduct business, the way we interact, move people and will add impetus to the economies of both Malaysia and Singapore," he said. The journey along the length of the HSR from Bandar Malaysia to Jurong East in Singapore will take just 90 minutes, less than half the time it takes to travel by car. The ease by which travellers pass through CIQ checkpoints could shave off more time, making it the mode of choice of travel between the two major cities. "This will transform the concept of a borderless world from a seamless travel standpoint," said Najib, adding that the HSR should be seen as more than just an infrastructure project, as it will also impact and transform the economies of communities surrounding its stations. "These stations are a demonstration of our commitment to an advanced, innovative and integrated development of the surrounding areas, more commonly known as transit-oriented development," said Najib. "From the beginning, the KL-SG HSR was never just a transportation project. It was always a project towards proving significant and even endless possibilities for the nation as a whole." Set to be completed by 2026, Najib said the project requires input and feedback from the public towards providing a product that would serve them better. Najib called on the public to view up close the details of the project and provide feedback when the MyHSR conducts its public inspection exercise at the seven locations from Nov 1.